The premium alumina zirconia belts are fabricated from heavy duty X weight premium blue alumina zirconia cloth. This is a long lasting material for superior performance and added life over aluminum oxide cloth belts. It will also easily cut through nails in the floor. Our aluminum oxide belts are made from a heavy Y weight material. They offer economic yet professional performane. All belts are made to order. Be sure that you order the correct size and grit. Belts are guaranteed for workmanship, but are not returnable if you order the wrong size. We now offer belt pricing in two levels. The standard pack is 10 belts per size and grit. 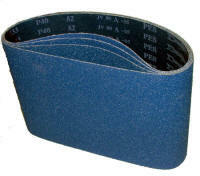 A pack of 50 belts per size and grit offers significant savings. In addition to the 7-7/8 x 29-1/2 common size listed below we can provide the special 7-7/8 x 39-3/8 size. Call 1-800-367-7291 or email us for pricing.